A High Speed Rail (HSR) network connecting Melbourne, Canberra, Sydney, and Brisbane has been shown to create more benefits than costs while fares would pay the operating costs of trains on such a network. Yet there seems little appetite in the government to build one. Initially, this may appear to be due to the high initial costs of $114bn to build it; but on closer inspection it may be necessary to re-evaluate the way we look at HSR as something for regional Australia rather than just for travel between the capital cities. Cost benefit analysis suggests that HSR is worth building. The Phase 2 Study found that HSR has a BCR (Benefit Cost Ratio) of 1.1 when a 7% discount rate is used. Thus, the benefits of building HSR are greater than the costs. However, the bulk of these benefits would accrue to the users of HSR in the form of time savings. In 2028 dollars, HSR users would receive $141bn of the total $180bn of benefits that HSR is expected to create. An additional $14bn of benefit go to operator benefits, which help to pay the operating costs and up to $16bn (14%) of infrastructure costs, but this still leaves the government paying for $98bn (86%) of infrastructure spending on HSR. (Sources: HSR Phase 2 Study Executive Summary, pages 42, 9). Higher fares would have the benefit of reducing the government’s cost below $98bn. However, it would do so by impacting leisure travellers the most, with many choosing not to travel on HSR. Business travellers would mostly still continue to use HSR, but the loss of many leisure travellers would see the total benefit of the project reduced. Although the Phase 2 Study claims the economic benefits in such a situation would still remain positive (i.e. a BCR greater than 1), this may be based on the less conservative 4% discount rate, rather than the more conservative 7% discount rate that is normally applied to transport infrastructure projects. The 1.1 BCR that a 7% discount provides is dangerously close to falling below the 1.0 required for the project to be economically viable. Therefore, as it stands HSR does not appear viable without a $98bn government subsidy, most of which would flow to business travellers who least need government welfare. The Phase 2 Study emphasises that HSR accrues more benefits as time progresses, given the growth in population. If governments work collaboratively and actively to preserve potential HSR corridors then HSR cost increases should be limited. Therefore, HSR becomes more viable as time progresses with benefits growing faster than costs. Since HSR gains most of its benefits from additional users, one way to increase the viability of HSR is to add additional population to the corridor. This would be much easier to achieve around the regional stations where constraints are much more limited than in the major cities. HSR could act as an enabler, allowing a greater number of people to live and work in regional areas without becoming isolated from those services only available in major cities. The Phase 2 Study’s assumptions of modest population growth in regional towns situated on the HSR route show that this was not considered as part of the feasability for HSR. In fact, the Phase 2 Study finds that HSR will produce $73.2bn in benefits from intercity travel, more than the $67.5bn in benefits from regional travel (Source: Department of Infrastructure, page 43). This finding that most of the benefits accrue from intercity travel rather than regional travel suggest that not enough is being done to massively develop regional Australia. HSR provides this opportunity which in turn makes HSR more viable. Achieving this would require us to rethink how HSR would work in Australia. Shadow Transport Minister Anthony Albanese recently wrote on HSR in which he concluded one well thought out and one not so well thought out point. His statement that “people could live in regional Australia and commute to work in the city” was not well thought out; this is true only to the extent that people can currently commute to work in Sydney by flying into Kingsford-Smith Airport, or any other major city airport. However his point that “companies could establish themselves in the regions, taking advantage of lower costs but comfortable in the knowledge the city was a short train ride away” hits the nail on the head. In order for HSR to be a success in spurring regional development people need to live, work, and spend leisure time in the same place. Employment opportunities as well as services that are needed on a day to day basis such as health and education would be provided locally. But the existence of HSR provides convenient access to services which are not needed day to day, such as medical specialists or major cultural festivals. If the 1,700km HSR corridor had a station every 100km or so along major regional cities, and these cities were allowed to grow to 800,000 residents each (as Dr Bolleter suggests in the Catalyst video), then it would be roughly equivalent to a doubling of the existing populations of Sydney and Melbourne combined. Once it becomes prohibitively expensive to retrofit the necessary infrastructure into our growing major cities, it will become cheaper to build it in regional cities even after the cost of HSR is factored in. Australian cities have not reached that point yet, but it remains a question of when rather than if they do reach that point. In the 2 years since then, this position has barely changed. Which is to say it has evolved (very slowly) in the right direction. The first change came on 16 May 2014, when the Assistant Minister for Infrastructure and Regional Development Jamie Briggs promised that federal funding from its asset recycling fund would not be restricted to roads. It followed through with this promise on 19 February 2015, providing $60m in funding to the ACT for its proposed light rail project. This funding was small, particularly compared to the billions going to the marquee roads projects; it also included a side comment from the Treasurer Joe Hockey’s office that “it has been a controversial project in the ACT” and that “there has been debate as to whether alternative projects may have higher potential economic benefits”. While the ACT project received lukewarm support from Canberra and could be described as tokenistic in terms of the quantity of funding; the 8 March 2015 decision to send $2bn to NSW changed that. With $1.3bn of that going towards the Sydney Metro project, the Federal Government is now providing more funding to this rail project than the $1bn it has committed to WestConnex. However, the rail funding came with strings attached in the form of requiring privatisation. Funding for WestConnex has no such restrictions. 14 June 2015 showed more promise on this front, with the Deputy Prime Minister Warren Truss stating that “the Federal Government is quite happy to fund metro rail projects”. This would appear to be in start contradiction to the statements quoted by Mr Abbott earlier that the Federal Government “have no history of funding urban rail” and would not be funding public transport. Perhaps the reason can be found by winding back the clock a month to 6 May 2015 when Greens leader Christine Milne was replaced by Richard Di Natale. In the past, Ms Milne had been resistant to supporting the re-indexation of the fuel excise because additional revenue would be hypothecated (i.e. promised to) road funding. However, when the Finance Minister Matthias Cormann offered to eliminate the hypothecation Ms Milne maintained her opposition. The party now has a new leader, and one who appears to be more willing to negotiate with the Government of the day. Following the May budget, Mr Di Natale met with Mr Abbott. In this meeting, he offerred to support indexation if some of the revenue was hypothecated to public transport projects. In that context, Mr Truss’ comments make a lot more sense. The policy taken to the last election – to not fund urban commuter rail, is a bad one. However, the question here is not whether the Government should abandon it. By funding Sydney Metro to the tune of $1.3bn, it already has abandoned it. Instead, the question is about when the Government will take a mode neutral stance on funding of transport infrastructure. Let Infrastructure Australia or the states determine the best transport projects and fund those. There’s a chance this possibility may become a reality sooner than expected. The Federal Government will provide $60m in funding to the ACT to help pay for a new light rail line as part of the federal government’s “asset recycling” policy. The Abbott Government has been unwilling up until now to fund urban rail, but had confirmed that rail projects would be considered for funding if state governments privatised state owned assets in a statement by the Assistant Infrastructure Minister Jamie Briggs in May of 2013. Federal funding may also be provided for public transport projects to Victoria if the sale of Melbourne Port goes ahead and to NSW if the electricity distribution network is leased. The NSW Labor Opposition announced its infrastructure plan, a scaled back version of the Coalition’s infrastructure plan with fewer projects planned but without the 99 lease of the electricity assets that the Coalition plans to go ahead with. Under its plan, a Labor Government would complete the North West Rail Link; the CBD and South East Light Rail; the M4 and M5 stages of WestConnex (with the latter connecting to Botany rather than St Peters); and build a light rail line around Parramatta. A second Harbour Crossing would be deferred for 5 years and be subject to a cost-benefit analysis and business case. Both the Inner West bypass road tunnel connecting the M4 and M5 as well as a Western Harbour road tunnel would both be scrapped. 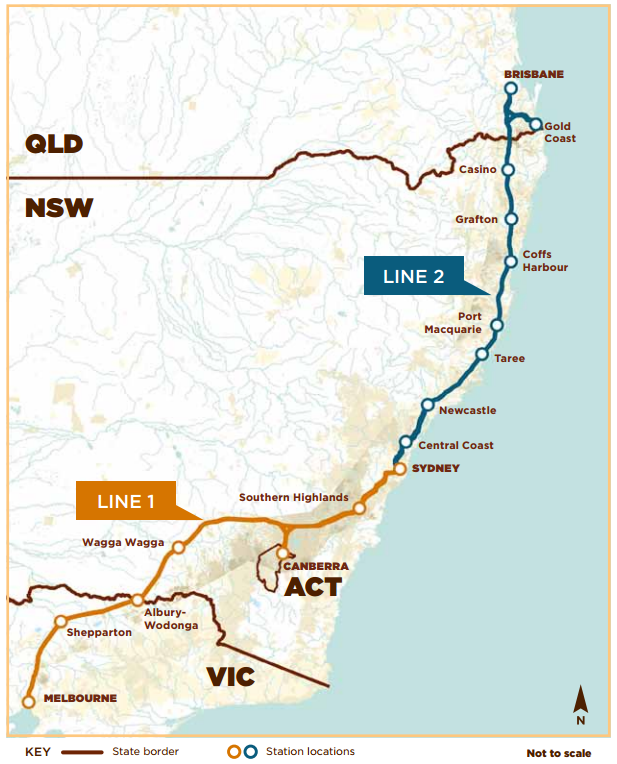 The second phase of the federal government’s High Speed Rail (HSR) study, released earlier today, finds that a 1,700km long East Coast HSR line could cost $114bn and will not be completed until the second half of this century. The line will not require any ongoing government subsidy to pay for operational costs or asset maintenance, with fares comparable to the equivalent air fare. The report finds a benefit to cost ratio of 2.3 (indicating that every $1 spent provides $2.30 of economic value), which is much higher than in the report commissioned by the Greens earlier this year that reported total benefits of $48bn, an amount less than the $114bn cost. If built, the project will be broken up into stages, with the Sydney to Canberra leg being the first. Even then, the earliest that portion will be operational is 2030, with an optimal commencement date of 2035. Brisbane may not be connected to Melbourne until 2058. The 1,700km of track includes 144km of tunnels, with 67km of this in Sydney. All up, tunnelling accounts for about one third of the cost of this project. The line will require a 200m wide corridor. Federal Infrastructure Minister Anthony Albanese was quick to dismiss the notion that this would eliminate the need for a second Sydney airport, pointing out that it was already congested and that overseas travellers will still require air travel. He also downplayed the possibility of medium speed rail, such as in Britain, arguing that journeys must be under 3 hours or else people will choose to fly instead and that this was why Britain was now upgrading its medium speed rail to HSR. He also accepted that the high construction cost was the most sensitive part of any potential HSR line and ruled out any funding for it in this year’s budget. The cost, roughly 4 times the cost of the National Broadband Network, is the biggest hurdle to building HSR in Australia. The interest expense of such a capital outlay alone would pay for the Gonski education reforms into perpetuity, and probably deliver far greater social and economic benefits to the nation. The discount rate of 4% also seems low, given that even the federal government’s long term borrowing costs, but a much more conservative 7% still provides a benefit to cost ratio of 1.1. This is above 1.0, but only barely, and suggests that this money could be spent on other more worthy infrastructure projects – such as the backlog of urban commuter rail improvements which Opposition Leader Tony Abbott has ruled out funding. Ultimately this was certainly a study worth undertaking, if only to confirm that Australia is not yet ready for HSR. However, it has done much of the preparation required for it, thus allows the federal government to revisit the idea again in 10 or 20 years time when some of the assumptions currently used may no longer be valid. But until then, the video below probably best describes HSR in Australia. Three things came up in the news in the previous week which are worth touching on just quickly – a new Cityrail timetable, the report by Canberra Airport recommending the construction of high speed rail between Sydney and Canberra rather than building a second airport in the Sydney basin, and the NSW Budget Estimates hearings. A few extra train services are being added to the timetable. (The associated Transport for NSW press release says it is 44 services per week, while the Telegraph reports 36 new services per week, but I count only 34.) It includes 4 new services each day (weekdays only) to the Illawarra/Eastern Suburbs Line as well as 2 new services each day (weekdays and weekends) to the Blue Mountains Line (all the way to Bathurst, which until recently was served by buses rather than trains). This is on top of the 63 new services per week introduced last year, bringing it up to about an extra 100 train services per week since the Coalition won the 2011 election. However, word is that it is the next timetable change, coming at the end of 2013, that will deliver real changes to service levels on the Cityrail network and will also involve a complete re-write of the timetable from the ground up. This is when the Liverpool turnback platform and Kingsgrove to Revesby track quadruplication are set to be completed, allowing for a significant increase in the number of trains operated. This is particularly the case for trains that use the City Circle, which currently is not being used to its full capacity during either the morning or afternoon peak. A HSR link was also quickly rejected by the Prime Minister, Julia Gillard, who said it was “some time away” from being viable. Hopefully one or both the state and federal government will bite the bullet and accept the conclusion of the both the Joint Study on Aviation Capacity and the Infrastructure NSW report, which recommend a second airport be built at Badgerys Creek. This location provides improved transport links and employment opportunities for the growing Western Sydney region. It’s an unpopular decision, but it’s the right one. The Transport Minister, Gladys Berejiklian, fronted the state budget estimates hearing on transport on Tuesday. Major information arising from that hearing included points below. @PennySharpemlc except you were asking about C & K sets...which are air conditioned. Oops. @PennySharpemlc @big_bertha1 C/K sets are air conditioned, L/R/S are not. So the question is, which are being kept? What could potentially be happening is that all non-air conditioned trains are being withdrawn from service, but kept warehoused for use in case of emergency, should a situation arise in which Cityrail was short on trains. In these cases, a non-air conditioned train is better than a cancelled train. Mr Wielinga’s response would be consistent with such a scenario. Or alternatively, it could just mean that increased numbers of services each day means that some non-air conditioned trains will be kept on in regular service in order to meet timetabling requirements. Ms Berejiklian was asked if a second harbour crossing that is not in the form of an under-harbour tunnel was being considered, but she did not directly address the question (page 30). She instead pointed out that 15 different options had been considered for Sydney’s rail network once the Northwest Rail Link (NWRL) is completed, but these were high level options (such as converting the existing harbour crossing to single deck metro, rather than building a new one, or maintaining double deck rolling stock on the entire network) that did not include specific alignments. She did, however, reaffirm that a second harbour crossing will be built (page 14). A figure cited by the Sydney Morning Herald of $4bn of extra work which would be required to handle the NWRL once it is completed is not new money, and these costs are already budgeted for. The narrower tunnels on the NWRL, large enough for single deck rolling stock but not double deck rolling stock, will result in cost savings. However, the cost savings are less than the cost of refitting the existing Epping to Chatswood section of the line to run the single deck trains (page 29). The real savings would occur when building new tunnels, most potentially an under-harbour tunnel, as single deck trains can handle steeper gradients than the heavier double deck trains. The Greenway – a pedestrian and bicycle path, which was originally part of the Dulwich Hill light rail extension before being deferred, would have costed $37m to build (page 34), compared to the cost of the light rail extension of $176m. The $176m figure includes $24m for rolling stock (page 16), and was revised upwards from $120m under the previous Labor Government, which (along with the delay in its completion) Ms Berejiklian says is because the previous government had not done any geotechnical work, considered where the rolling stock would be acquired from, etc. A final decision on George St light rail will be made in the final transport plan (page 33), to be released by the end of the year. Opal is on track to be rolled out on ferries in December of this year. The Director General of Transport for NSW, Les Wielinga, was never a full director of Infrastructure NSW, he was only ever a temporary “guest” (page 9). Mr Wielinga also argued that the differing conclusions made by his organisation (Transport for NSW) and Infrastructure NSW was due to each taking a different approach, and so different solutions were inevitable but that he also did “not think this is a problem”. Many issues have been raised over plans for the Northwest Rail Link (NWRL), that it’s single deck, that it wil require more transfers, that it will require an expensive second harbour crossing. These are legitimate issues that are raised, which in my opinion when considered as part of the big picture of long term transport planning will still result in the conclusion that what the government is currently planning is the right approach to take. But the most recent complaint: that it will shut out high speed rail (HSR), raised by the NSW Business Chamber earlier this week, is just plain hard to swallow. The full report is available from their website, and I’d encourage you to read it if you’d like a better idea of how transport planning works (even if, like me, you disagree with the conclusions). This is an excellent point. 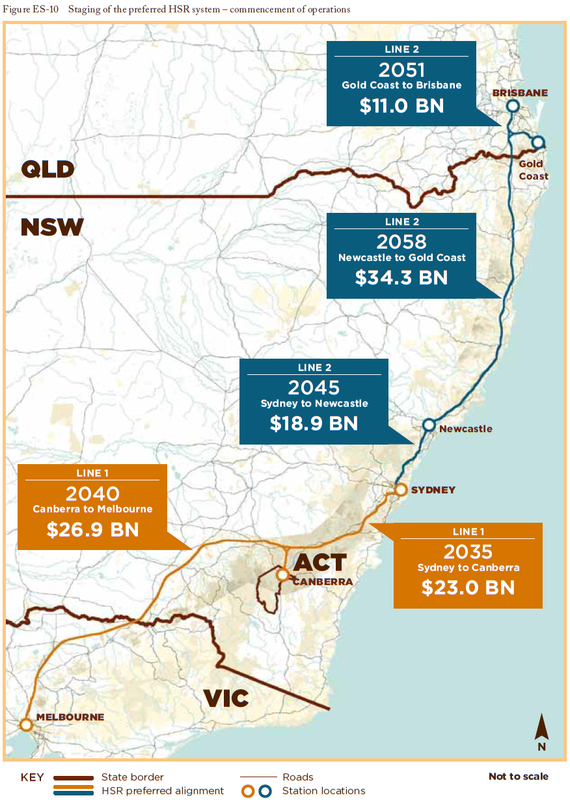 It would indeed be much cheaper to use existing rail infrastructure within the city limits, as doing so could bring the cost down from as high as $100bn to just a few billion dollars for a shorter Canberra-Sydney-Newcastle link. 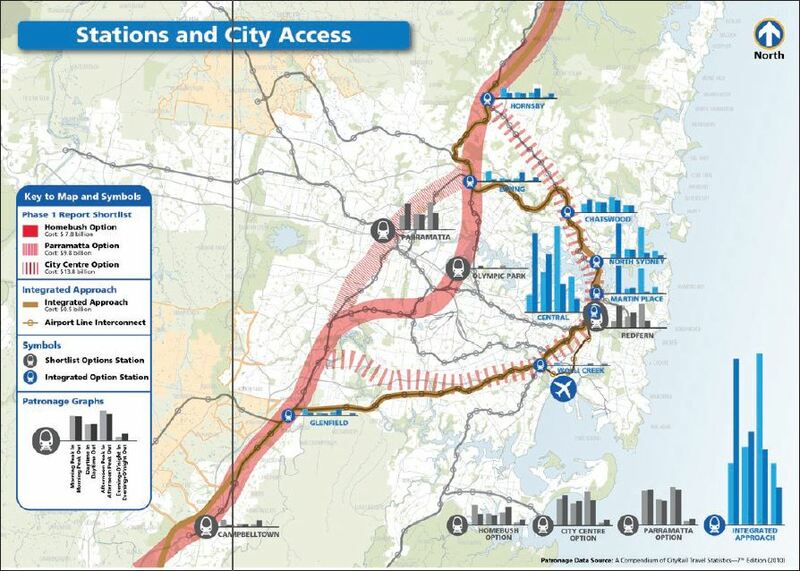 The problem occurs when the report then insists that the best connection between Sydney and Newcastle is via Chatswood and Macquarie Park. A quick look at the timetable shows that a train takes about 60 minutes to get from Central to Hornsby via Macquarie Park, compared to 51 minutes via Gordon, and only 36 minutes via Strathfield. The reason for this is that only the via Strathfield route has additional track pairs, which allow faster trains to overtake slower ones. Sending HSR trains via the slower route (as this report suggests), would cause them to be stuck behind slow trains that stop at every station. This strategy is followed on the Southern approach to Sydney, where trains would come in via the East Hills Line, which also express tracks. See map below. Ideally a HSR network would not be integrated with suburban trains (and the report acknowledges that this is the long term aim), and only in the short term it would it use existing infrastructure (to keep initial costs down). However, no reason is given for why a second harbour crossing is needed, other than the existing capacity constraints. But if that’s the case, then why not just share the existing crossing on the Sydney Harbour Bridge for HSR and suburban trains, leaving the new crossing exclusively for single deck metro trains? Why does the new crossing have to be built to HSR specifications when the current one already is? Not that this should matter anyway, as it would be faster to use the via Strathfield route. If HSR users want to reach Macquarie Park, Chatswood or North Sydney, then there will be frequent and fast suburban trains from a number of connecting stations that they could use. This statement just makes no sense. Only the NWRL past Epping (which would not be used by HSR anyway) and the second harbour crossing would be incompatible with HSR. And there’s nothing stopping HSR from using the existing harbour crossing, so it’s hard to see how HSR has been “planned…out of the current network”. As mentioned, the existing portion of the future NWRL already built (between Epping and Chatswood) is already capable of taking HSR. While the second harbour crossing may not be, HSR could easily shift to the existing harbour crossing once they reach Chatswood in order to reach the CBD. Yet building the second harbour crossing at HSR specifications would increase the cost of such a project, reducing (or perhaps eclipsing) the proposed cost savings of having HSR use that crossing. With the Federal Government taking a more active involvement in funding infrastructure that was traditionally the responsibility of the states, this is an excellent suggestion. Both levels of government need to be on the same page and moving in the right direction in order to overcome the infrastructure deficit that Sydney suffers from. Ultimately, the undelying argument that this report is trying to give: that using existing infrastructure initially and planning between state and federal governments to make sure that these options are maintained, is a very good one. Doing so would allow the sorts of cost savings that would make high speed rail (or even just medium speed rail) more likely to actually get off the ground. And if there’s one thing to take from this report, it’s definitely that. Unfortunately, the bit about the NWRL (a red herring, in my opinion) has garnered most of the media attention. It didn’t take long after the NSW government declared the end of the line for Sydney’s iconic monorail for other interested parties to put their hands up. Both Hobart and Canberra have shown interest in taking Sydney’s monorail. Last week the University of NSW threw its hat into the ring, with the announcement that the Student Representative Council was offering $1.2m to buy the monorail in order to help students get around the hilly campus. The story was picked up by MX, ABC News Radio, and 2UE. The only problem was, the whole thing was a big hoax, all part of UNSW’s annual Foundation Day prank. Minister for Transport Gladys Berejiklian said she welcomed any interest in the purchase of the monorail. The next week, on Monday 30 July, David Oldfield on 2UE even devoted a 25 minute portion of his radio show to the issue. He took it quite seriously, and didn’t notice that the first two callers he spoke to were having him on.